In 2012, a documentary titled The Anderson Monarchs followed the journey of an all-black girls soccer team from Philadelphia. Included in the film was a group interview featuring every black player who was a part of the U.S. Women’s National Team’s (USWNT) then-27-year history, each speaking about her experiences in the sport. A large room was not required. The visual of the small contingent alone told the story of what it is like to be a black woman in soccer. A look at the 2017 USWNT’s 35-woman January camp roster, however, tells an updated story. Taking the field in Carson, California, were 11 black players for the team’s 10-day camp – not including 18-year-old phenom Mallory Pugh, who was unavailable with a lingering knee injury, and proven star Sydney Leroux, who has been out since January 2016, when she announced she was pregnant with her first child. Earlier this month, The USWNT announced its 25-woman roster for this week’s SheBelieves Cup. Of the 25 players listed, six players are black. The welcome presence of black women on the sport’s best team in the world highlights a potential turn of the page for black soccer players in the U.S. women’s game. A deeper examination will show that the increased presence of black players is not solely isolated to the women’s national team, but instead is indicative of a larger trend in the sport. Representation of black women in soccer, on all levels, is on the rise. When it comes to the history of black female soccer players and the women’s national team, most signs will point back to one player – former national team goalkeeper Briana Scurry. 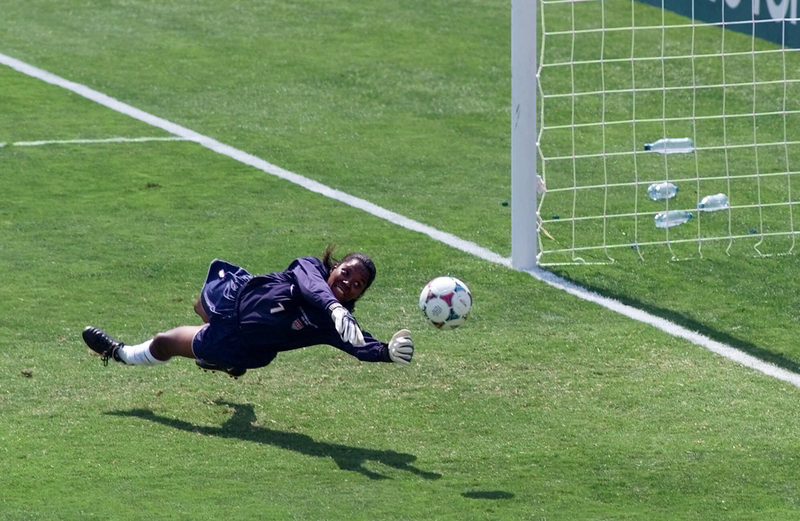 Known for her save during penalty kicks, which helped the U.S. defeat China in the 1999 FIFA World Cup final, Scurry totaled 173 caps for the USWNT. She is the lone representation of black women in soccer at the recently erected National Museum of African American History and Culture in Washington, D.C., where, sandwiched between greats such as Eddie Robinson and Michael Jordan, an homage to Scurry is displayed as a representative of the impact of Title IX. Scurry believes that when it came to cracking the coveted and competitive national team roster, black players were assessed differently from their white counterparts. According to Scurry, black players had a much shorter leash when it came to showcasing their staying power. United States’ goal keeper Briana Scurry (1) blocks a penalty shootout kick by China’s Ying Liu during overtime of the Women’s World Cup Final at the Rose Bowl in Pasadena, Calif., Saturday, July 10, 1999. Scurry cited former national team defender Tina Ellertson as a prime example of a great player with “wonderful physical skill,” who was not given enough of a grace period to get her footing on the team. Looking to the present, Scurry believes that under current head coach Jill Ellis, who has served at the helm of the women’s national team since 2014, the team has seen a shift. She credited Ellis for diversifying the roster. The personnel changes have also caught the attention of current national team players. Short, along with forwards such as Crystal Dunn, one of the top forwards in the world, Christen Press, who has been on the national team since 2013, and national team newcomer Lynn Williams, were all present at the January camp. While players such as Press offered a veteran presence, 16-year old Brianna Pinto, who is verbally committed to attend the University of North Carolina at Chapel Hill in fall 2018, was also invited to camp. 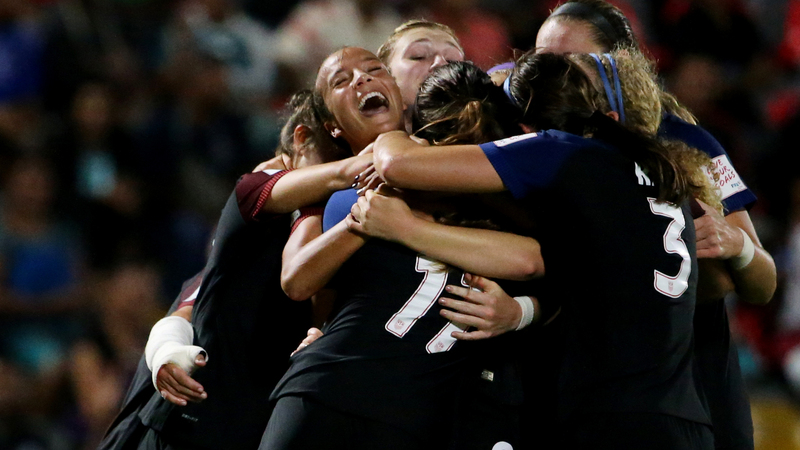 Pinto is one of the youngest USWNT call-ups in team history. Short hopes that as more and more black players appear on the national team roster, the impact of such a feat can inspire the next generation looking for a connection to the sport. The growing presence of black players on the national team is a byproduct of increased participation at the collegiate level, which has grown significantly in the past 15 years. In 1999, black female soccer players made up just 2.9 percent (189 players) of all NCAA Division I female soccer players, according to NCAA demographics reports. During the 2015-16 season, however, that percentage more than doubled, with black players representing 6.8 percent (622 players) in NCAA Division I. The increased participation has also resulted to dominance on the pitch. 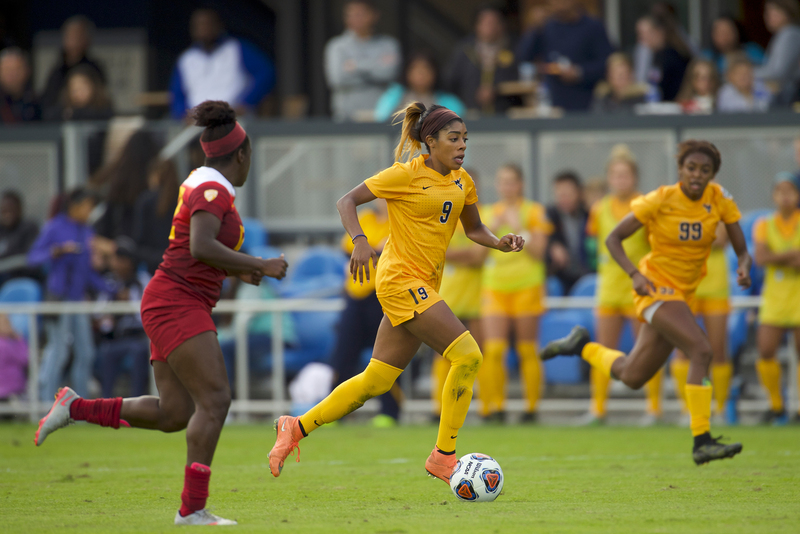 In this year’s NCAA Division I women’s soccer championship match between the University of Southern California and West Virginia University, nine out of 22 starters on the field were black — a College Cup record. The winning coach, Keidane McAlpine of USC, became just the second black coach to win a College Cup title. The first was won by University of Portland head coach Clive Charles in 2002. A month later, in a historic National Women’s Soccer League (NWSL) draft, five of the top 10 players selected from collegiate teams were black. Ashley Lawrence (9) of West Virginia University pushes the ball downfield against the University of Southern California during the Division I Women’s Soccer Championship held at Avaya Stadium on December 04, 2016 in San Jose, California. Joining Mills as top 10 selections were Darian Jenkins of the University of California-Los Angeles (No. 7), Ifeoma Onumonu of the University of California-Berkeley (No. 8), Margaret Purce of Harvard University (No. 9) and Miranda Freeman of USC (No. 10), who was also invited to the January camp. Mills and Freeman, along with IBV (Iceland) defender Adrienne Jordan were recently selected to represent the United States in the La Manga Cup in Spain as members of the under-23 roster. Last month, the league announced that it signed a three-year deal with A&E Networks to broadcast league matches. Mills hopes that this draft class’ transition into the NWSL, which begins just its fourth season this April, will start to inspire young girls of color to play the sport. Women’s soccer in the United States remains one of the most expensive sports to play in the country – a stark contrast to its perception around the world as a sport of accessibility. According to past players, participation and development in the sport boils down to two factors: income and location. As a result, the sport has been perceived as being reserved for the white middle class for decades. Each of the past two major tournaments for the USWNT have featured only three black players. During the 2015 World Cup in which the team won gold, the team featured Press, Leroux and midfielder Shannon Boxx. In the 2016 Olympics, the USWNT roster featured only Dunn, Press and Pugh. “Today, you see a lot of predominantly white young women because their parents, when they were younger, were the ones who could afford it,” Scurry said. Competitive soccer in the United States is a pay-to-play sport. While it may not break the bank to participate in a local recreational league, to develop skills at an elite level and be recruited by NCAA schools come with a heavy price that can set families back a few thousand dollars. The financial demands of the sport have become a barrier to entry for many families. Scurry believes that the changes occurring in today’s soccer climate, with more black players becoming visible in the sport, have more to do with the continuing rise of the black middle class and affluent black families moving to the suburbs rather than an increase in access to underserved communities. According to U.S. Census reports, total income for black households with children under age 18 has grown noticeably over the last 15 years. In 2015, census records show that 642,000 more black households made a total income of $100,000 or more compared with the total in 1999. A 2011 report from the Metropolitan Policy Program at the Brookings Institution shows that black migration to the suburbs increased by 14 percent from 1990 to 2010. 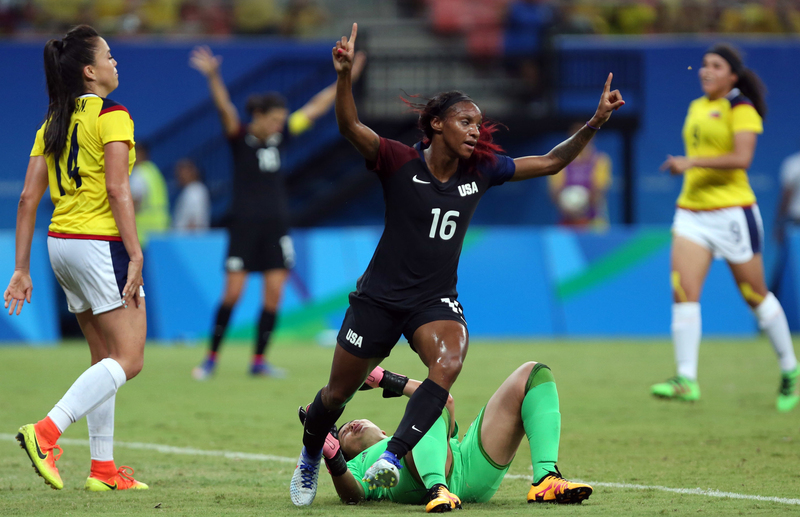 United States’ Crystal Dunn, center, celebrates scoring her side’s first goal during a group G match of the women’s Olympic football tournament between Colombia and United States at the Arena Amazonia stadium in Manaus, Brazil, Tuesday, Aug. 9, 2016. While it is viewed as an overwhelming positive that black families are increasingly able to afford the financial demands of the sport, there are largely underserved communities where the ability to play soccer remains out of reach. Hucles, who served as the president of the Women’s Sports Foundation from 2015 to 2016, said that when it comes to access to the sport for young black girls, research shows that opportunities are minimal. Through initiatives and programming, organizations such as the US Soccer Foundation (USSF) aim to give youths in underserved communities access to soccer. Slaton, who serves on the board of directors of the USSF, said that while access is a first step, numerous further steps must be taken to bridge the gap that separates those with access from those who are exposed to both access and opportunities for development. According to Slaton, the issue of development should be addressed by US Soccer, adding that at the moment the organization is preoccupied with winning championships. Mallory Pugh #9 of United States screams as she congratulates Ally Watt #11 after she scored against New Zealand during their Group C match of the FIFA U-20 Women’s World Cup Papua New Guinea 2016 at PNG Football Stadium on November 17, 2016 in Port Moresby, Papua New Guinea.